Representatives of the Kingdom’s private sector this week urged the European Union not to cancel the Everything-but-arms (EBA) scheme in response to a perceived deterioration of human rights and democracy in the country. Friendly countries often spy on each other. The United States has been caught spying on its allies in Europe, despite their normally tight, close-knit diplomatic ties. Cambodia Airways, the latest passenger airline to enter the Kingdom, launched its first domestic flight on Tuesday. The National Election Committee (NEC) has decided to allow special guests to observe the sixth mandate National Assembly election this July 29, according to the NEC’s decision on Tuesday. Cambodian rice exports decrease nearly six percent year-on-year during the first half of the year, while an official from the Ministry of Agriculture urged the private sector to secure a solid position in the international market. 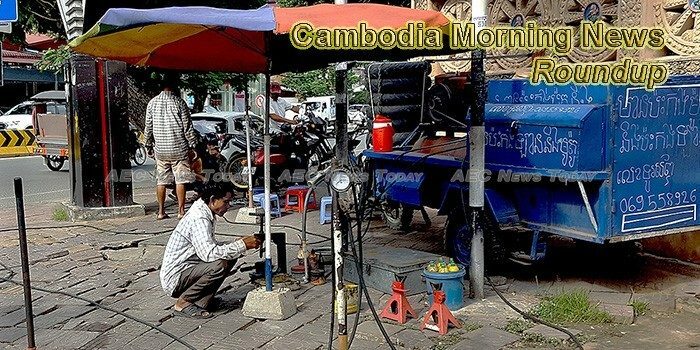 Cambodian military officers, gendarmes, and police officers are actively campaigning for the ruling Cambodian People’s Party (CPP), in violation of Cambodia’s law requiring political neutrality, Human Rights Watch said today. Construction work for the expansion of the Stung Hav International Seaport in Preah Sihanouk province has yet to begin, with the companies behind the project still working on the feasibility study, according to the Ministry of Public Works and Transport. Kamchay Hydropower Dam will open its sluice gates Wednesday evening at 5 p.m, thus urged Kampot authorities and citizens to take timely action accordingly, according to announcement of Sinohydro Kamchay Hydroelectric Project Co., Ltd. Fresh News received earlier. The Ministry of Mines and Energy has granted a mining license to Renaissance Minerals (Cambodia), a subsidiary of Australia-based Emerald Resources NL, to extract gold in Mondulkiri province. On behalf of the Royal Government and people of Cambodia, Prime Minister Hun Sen sent his heartfelt condolences to the Prime Minister and the people of Japan, particularly the bereaved families at this moment of profound grief and immense loss, according to the press release dated on 10 July 2018. His Majesty King Norodom Sihamoni and Her Majesty Queen Mother Norodom Monineath Sihanouk donated $1 Million to Kantha Bopha Hospital, providing free treatment to children nationwide, according to His Majesty King Norodom Sihamoni official facebook page on Wednesday. The Ministry of Health’s Communicable Disease Control Department (CDC) has warned the public to beware of the seasonal strain of influenza H1N1, also known as “swine flu”, during the current rainy season.